The parish of Rochester with Byrness lies at the northern end of the Rede Valley in Northumberland. Its northern edge borders on Scotland, to the south lies the parish of Otterburn, on the eastern side the landscape is dominated by the Ministry of Defence ranges and to the west lie the hills separating the Rede Valley from North Tynedale. The main highway is the A68 which provides one of the main routes between England and Scotland. Along this road are situated the two main settlements of the parish. The village of Rochester, together with High Rochester around the ancient Roman fort of Bremenium, and the village Byrness, originally a forestry village and now the largest centre of population. Outside these villages people live in relatively isolated farms and homesteads. There is a great sense of community in the parish, despite the sparse population. The majority of families have lived in the area for many years, but a large number of incomers have also settled here. Both villages have a church and a village hall and social events are well attended. The upper Rede valley is a haven for wild life including red squirrels, deer, badgers and otters. If you are lucky you could spot sea trout and salmon. The fells and forest are full of a variety of birds such as woodpeckers, buzzards and curlew while on Catcleugh Reservoir can be seen oyster catchers and swans. In the 19th century the reservoir was built to provide water for Tyneside. 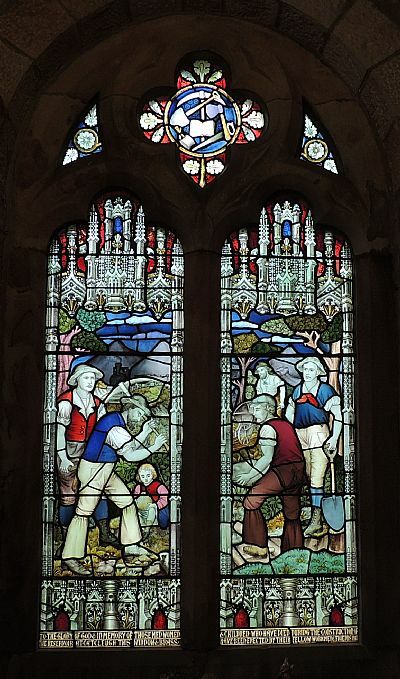 In the church of St. Francis at Byrness, which is the smallest church in Northumberland, a stained glass window commemorates the workers who died during the construction of Catcleugh Reservoir. One of the original workman’s cabins can still be visited on open days. Otterburn training lies in north Northumberland and a major part of it sits within the parish of Rochester with Byrness. Military training has taken place in this area since 1911 when the range was purchased from Lord Redesdale. In total the range covers 58,000 acres. The training area is the primary artillery range in the United Kingdom and is used by members of all three services and also by foreign forces. Major exercises take place all year round in a challenging rugged environment and the range is used by over 50,000 personnel annually. The headquarters for the range is at Otterburn camp where there is also accommodation for some 1,300 personnel. Employing over 100 staff the MoD is a major contributor to the economy of north Northumberland. The training area is rich in wildlife and archaeology and large areas are open to the public at any time.